There was a time when Marvel’s The Avengers was a risk. Not just because it was a new kind of franchise film that was assembled Voltron-style from five preceding movies (Iron Man, Thor, Iron Man 2, Captain America: The First Avengers, The Incredible Hulk), but also because its team-up event narrative, rooted in a shared universe of superheroes, was recognizable to anyone who knew what a “pull list” is. It was pure comic-book storytelling. Between Bryan Singer’s first X-Men movie and Jon Favreau’s Iron Man, superhero movies were wary about adopting anything that was too comic book-like—especially narrative tropes like crossovers, multiverses, events, and team-ups. It wasn’t only that they were too cumbersome, even ambitious, to implement; studios also generally feared that mainstream audiences wouldn’t accept them. Marvel’s gamble to directly transplant the storytelling devices they had been using for decades in their comic books to the big screen changed things. Or, rather, the $1.5 billion worth of worldwide viewers did. 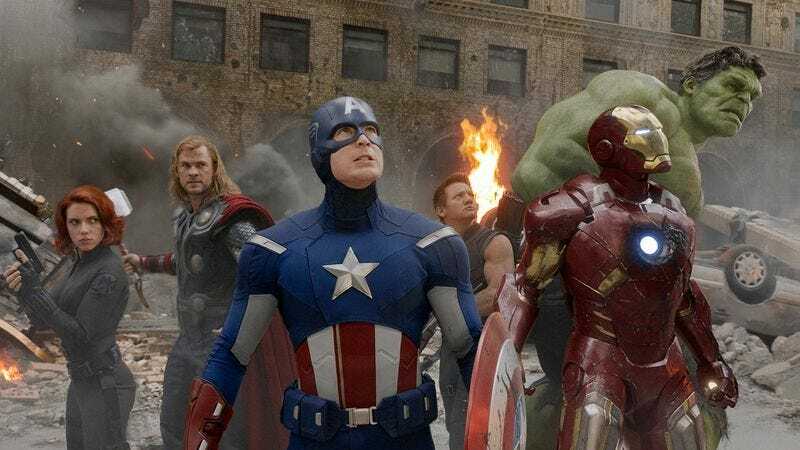 The Avengers’ success launched a golden age of superheroes, in which the stories of the caped and cowled are TV-rating dependables and box-office behemoths. Audiences will now accept talking raccoons in space, sentient androids with forehead jewelry, telepathic gorillas, and Oscar Isaac walking around in death metal Smurf-chic. What’s more, they’ve increasingly embraced crossovers, team-ups, and shared universes that characters can navigate freely outside their own immediate worlds and lives. Captain America’s Falcon now enters into fisticuffs with Scott Lang in Ant-Man. Spider-Man and Wonder Woman appear in movies like Captain America: Civil War and Batman V Superman: Dawn Of Justice before even getting their own stand-alone stories. The Flash easily hops to an alternate Earth, the past, and other networks to visit doppelgängers, old selves, and Supergirl. But amid the success and enthusiasm for cinematic universes, superhero team-ups and clashes, and event-driven storytelling, it’s become easy to forget one thing: Comic-book narrative devices are still very new to both the big and small screen. Hollywood and networks may have embraced them with their usual copy-and-paste vigor, but this union is still in its honeymoon. Which is to say, there are still unmet reality checks and challenges ahead, both inherited from comic books and unique to adapting them to the screen. As the superhero genre pushes forward toward longevity with more TV shows on the horizon (Punisher, Cloak & Dagger, Krypton, Hellfire, Legion), and more than a dozen movies between 2017 and 2020, it will face challenges—not tomorrow or next year, but five, 10, even 15 years from now. These are some of the challenges that the genre must contend with if it wants to continue to thrive. The comic-book universes of Marvel and DC are built on continuity. Characters inhabit the same world, moving between each others’ series, while carrying forward their experiences and history—individual or joint. All this compounds into continuity, built over hundreds of issues, which creates the connected worlds that Marvel and DC are now recreating in their cinematic universes. Something like Captain America: Civil War draws from almost all of Marvel’s post-Iron Man movies, and it’s a brand of storytelling that’s been a key to the success of the golden age of movie superheroes, because it gives audiences the feeling that every film matters and adds up to a greater whole. The challenge that will present itself in the future is the same one that’s already been an albatross to comics for decades: How do you keep worlds with compounding histories accessible to both new and existing audiences? How do you avoid creating a homework effect, where keeping up requires an increasing amount of time, money, and energy? It may be thrilling to see Marvel’s 13th film, Captain America: Civil War, deliver on years of setup, but it still required the work of seeing all those films that directly link to it. Because these onscreen worlds are designed to be experienced both individually and cumulatively, that means you’ll always have to keep watching. By the time Avengers: Infinity War—Part 2 comes out in 2019, Marvel will have 21 movies, representing roughly 50 hours of viewing, in their universe. What happens when more hours get added and suddenly we’re in 2030, and The Avengers V. Justice League: Crisis Wars—Part 3 is in theaters, or The Adventures Of The Supergirl And The J.S.A. premieres on TV, and to make some sense of it all you have to see 40 movies and 80 hours of television? That’s a large commitment to ask of your audience, and short of a universe reset (a common strategy for comics to combat this problem), it’s a problem studios are going to have to navigate if they want to continue to keep the genre going. We don’t have to look far ahead into the future to get an idea of one challenge superheroes will face. Batman V Superman’s fumbled attempt to launch Warner Brothers’ DC Cinematic Universe foreshadowed what happens when a weak link is produced in the growing chain of a shared universe. When the success of one film—or a whole film slate—is dependent on others, studios are taking big risks. The larger worlds in comic books can survive a bad issue or two, because series are produced in large volumes and released monthly or biweekly. It makes it easy to wash away or forget disappointment. But when we have two superhero movies or shows a year and a long period between new installments, it puts tremendous pressure on movies to not just succeed on their own terms but also ensure franchise survival. If a project fails, you’ll see the scrambling damage control happening around Justice League and the increased pressure put on Suicide Squad to save Warner Brothers’ DC universe. If the negative reviews, and reports of a troubled production, are any indication, even David Ayer’s film may not prove to be the savior WB is hoping for. But all the quality (or damage) control in the world won’t prevent the law of averages. Studios like Marvel may insulate themselves from failure with competent playbook filmmaking, so that even duds (Iron Man 2, Thor: The Dark World, and Avengers: Age Of Ultron are commonly cited) are survivable thanks to goodwill earned and interest sparked in their larger universe. But even Marvel will someday face its own Batman V Superman. And unlike with the failure of a normal franchise sequel, the ripples could be far more wide-reaching. Say, for example, Infinity War or The Defenders (Marvel’s forthcoming Netflix heroes team-up) fails to deliver after all that buildup. The disappointment could domino outward and sour audiences of both future and past projects. That’s a lot of responsibility for one project to overcome. Actors, unlike comic book illustrations, age. When Iron Man was released, Robert Downey Jr. was 43. When Avengers Infinity War: Part II comes out, he’ll be 54. In adapting the never-ending universes of comic books, movies and TV shows will eventually face the challenges of the human factor. What happens when Downey ages out of playing Tony Stark? What if Grant Gustin loses interest in playing The Flash, or Chris Evans finally makes good on his occasional threats to quit acting? The obvious answer is recasting, something audiences have proven amenable to. Don Cheadle seamlessly replaced Terrence Howard as War Machine, and Mark Ruffalo easily slipped into Edward Norton’s purple Hulk pants. We’ve had three Spider-Men in just over a decade with little turbulence. But with aspirations of building worlds around continuity of story and character, the actors inhabiting them for longer periods still have a major effect on making it feel cohesive. The appeal of the Marvel universe is seeing Tony Stark develop or interact with its growing catalog of characters. You could recast him or let someone else assume the Iron Man mantle (another common comic story device), but something will still be lost: 11 years of audience investment in an actor and character. That absence will be felt. Repairing that will be a challenge, and it’s not one unique to Marvel. By the time Avengers: Infinity War—Part I is released in 2018, it will have been six years since Thanos’ appearance was first teased at the end of The Avengers. By the time The Defenders airs in 2017 or 2018, it will have been three years since Daredevil set it on that path. By the time Justice League comes out in 2017, it will have been only a year since Batman V Superman set it up. What all those projects have in common is that they’re a product of adopting comic-book event-driven storytelling: using individual stories to build toward heroes teaming up to face a larger threat. The challenge of that being applied to big and small screens emerges when you consider what the above projects don’t have in common: consistent timing. With cinematic universes orienting themselves around an event, it begs the question: What happens when an event like Justice League or Infinity War is over? When do you roll out the next one? How many movies do you link to its setup? If you let events happen too close together, they risk being unearned or underdeveloped when they come out. They can also induce the fatigue that can plague comic book readers who grow weary of events mandating that so many individual series be tied to them. If events are spread too far apart, like if Marvel spent another 10 years building up to its next Infinity War-style event, it could be asking too much commitment from audiences. Studios need to face the challenge of figuring out—without much benefit of trial and error—how to space out their “It’s all been leading up to this” filmmaking so as not to burn out audiences or test their patience. Do any of these possible solutions tidily solve all of the challenges facing superhero films and shows? No. But that speaks to the complexity of what they face in the years ahead. Without access to Marvel or DC’s playbooks, it’s hard to know what the future of superhero stories will really be like. But maybe that’s not such a bad thing. It’s never boring to see the small and big screen adapt to, and evolve with, new forms of narratives. Which is to say, whether comic-book story devices succeed or flounder in the future of superhero narratives, it’s certainly going to be entertaining to watch. Who knows, maybe it’ll even be more entertaining than the movies and shows themselves.